Onion sets arrive soon! It’s time to get them into the ground. The soil should be worked to a depth of 8-10″ and should have good drainage and be in full sun. Spread about 2 pounds of fertilizer (10-10-10 or 10-20-10) over a 100 square foot area and mix into the top 3-4″ of soil. Pick out the best developed plants and plant 3/4″ to 1″ deep and 2 to 3 inches apart. Onions require a high source of nitrogen. A nitrogen-based fertilizer (ammonium sulfate or ammonium nitrate) should be applied at the rate of one cup per twenty feet of row. The first application should be about three weeks after planting and then continue with applications every 2 to 3 weeks. Once the neck starts feeling soft do not apply any more fertilizer. This should occur approximately 4 weeks prior to harvest. Always water immediately after feeding and maintain moisture during the growing season. For weed control a pre-emergent herbicide (DACTHAL) should be applied prior to planting. This will provide weed control for approximately one month after planting. Other products such as GOAL and BUCTRIL, can assist in weed control during the growing season. Always follow label instructions. For organic gardeners a rich compost high in Nitrogen should be incorporated into the soil. Unfortunately, there is not any product available to assist in weed control so the only method will be cultivation. While cultivating be careful not to damage the onion bulb. As the onion begins to bulb the soil around the bulb should be loose so the onion is free to expand. Do not move dirt on top of the onion since this will prevent the onion from forming its natural bulb. Start early with cultivation practices. Onion harvest should occur in May and June or when the onions have matured to the desired size. Pull the onions, leave laying in the row for 1-3 days for drying, clip the tops and roots and store in a cool dry place until needed. 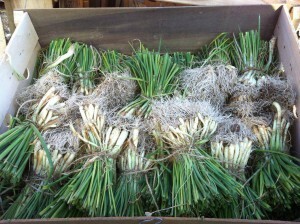 Stop by Mansfield Feed Mill and get your onion sets in the ground or give us a call at (817) 473-1137! We have all your garden needs right here in Mansfield, TX. This entry was posted on Friday, December 14th, 2018 at 10:29 am	and is filed under News & Updates. You can follow any responses to this entry through the RSS 2.0 feed. Both comments and pings are currently closed.